Before productboard did you log features in a spreadsheet or a tool that exports to XLSX/CSV? 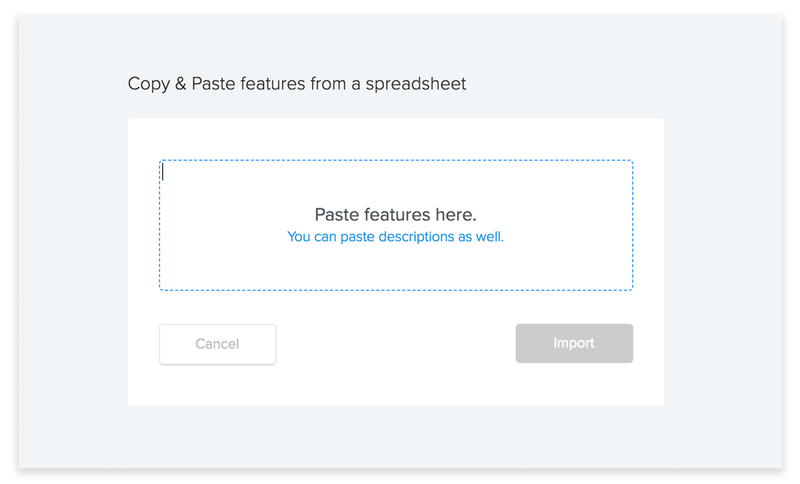 Import features from spreadsheets to your Features board using the Paste List of Features tool. Paste the data into field provided. Use the dropdowns to verify productboard has correctly identified the feature name and description fields. When Features are grouped by Hierarchy, features are imported to the Unsorted feature ideas section of the Features board. If Unsorted feature ideas is not visible, make sure it is filtered onto your board by selecting it in the Hierarchy filter. To reorganize features, drag and drop one at a time them to a new section. Or, multi-select features and then use the Hierarchy dropdown in the side pane to move them all to a new product/component, assign a new release, or update status.